Image caption This is not about terminator robots but "conventional weapons systems with autonomy"
Among those leading efforts for the worldwide ban is HRW's Mary Wareham. "We are not talking about walking, talking terminator robots that are about to take over the world; what we are concerned about is much more imminent: conventional weapons systems with autonomy," she told BBC News. "They are beginning to creep in. 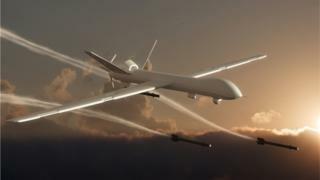 Drones are the obvious example, but there are also military aircraft that take off, fly and land on their own; robotic sentries that can identify movement. These are precursors to autonomous weapons." "When they fail, they fail in unpredictable ways," he told BBC News. "As advanced as we are, the state of AI is really limited by image recognition. It is good but does not have the detail or context to be judge, jury and executioner on a battlefield. "An autonomous system cannot make a decision to kill or not to kill in a vacuum. The de-facto decision has been made thousands of miles away by developers, programmers and scientists who have no conception of the situation the weapon is deployed in." "So it may well be that the people who made the autonomous weapon are responsible."